The television is filled with reality shows that in some way deal with all things vintage and antique. From the Grandmother of All Shows Antique Roadshow to some of the newer programs--certainly some more engaging than others. At the low end of the spectrum are the shows about hoarders. Those really pray on the folks who for one reason or another take comfort in stuff and chaos in their living environment. I am certainly not a hoarder. Oh no I am not. But I have found out what I am--and the syndrome/disease has a name just made for a new reality show--- HORROR VACUI. HORROR VACUI is the "fear of the empty. The process of filling an entire space with detail." Yes sir--that's me. 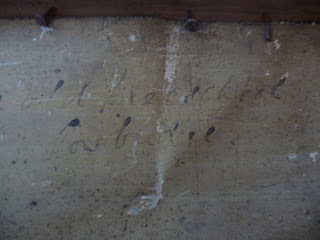 Just look at the walls in our dining room. My philosophy? There is always room for one more at least as our dining room is concerned. Painting, french affiche, clock, To The Life Boats Sign, framed botanical, framed needlework, decorative metal clock faces, quirky things--FILLING THE ENTIRE SPACE WITH DETAIL. At one point, horror vacui, specifically in art, called outsider art--was thought to be influenced by the mentally unstable and inmates of psychiatric hospitals. Oh dear. 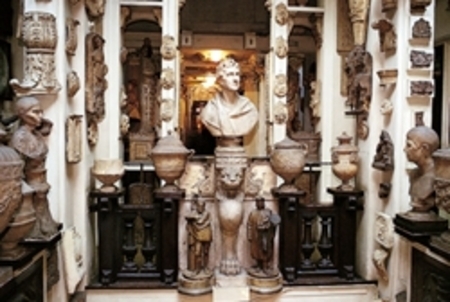 Italian art critic Mario Praz used the phrase to describe "the suffocating atmosphere and clutter of interior design in the Victorian Age. " Shame on you Mario. The Victorians were fabulous people with cluttered everything-- fabulous art (thank you Pre Raphaelite painter Edward Burne-Jones) Fabulous fabrics (thank you William Morris) Fabulous writing (Thank you John Ruskin) and fabulous gardens (thank you Gertrude Jekyll). Everyone of them did not follow the sparse approach--and more was better. Ever visited Sir John Soane's house in London?--talk about horror vacui. This is Sir John's house--not our dining room. I should get on the stick and pitch this show to hollywood. Dear Husbola and I will star in it. Along with our pals Edward, William, John, Gertrude and Sir John. Don't overlook the plant and flower offerings in your local grocery store. Especially after a holiday. These little sort of perennial-ish shamrock like plants have become a favorite of mine. When it gets warm out--they are very happy outside in dappled shade and bloom and bloom all summer long. 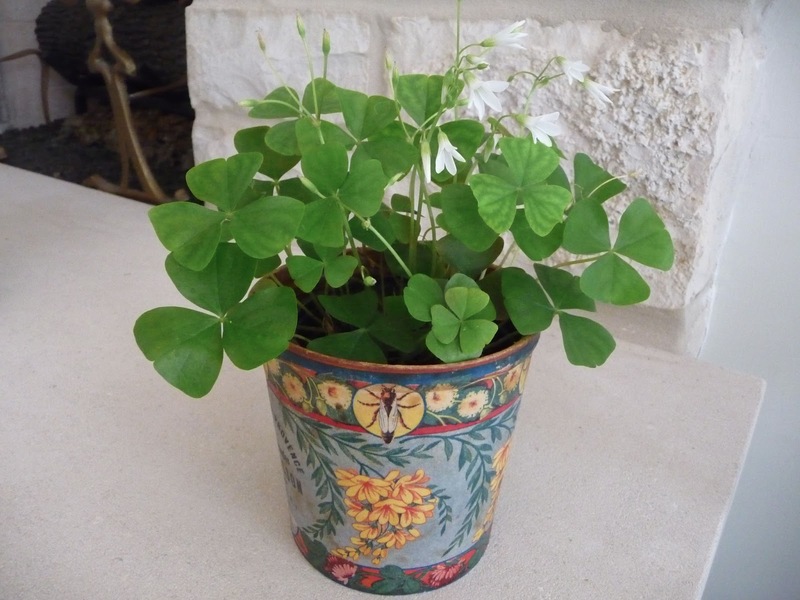 Dear Husbola, friend to leggy geranium and all tender plants -- usually rescues the pots of these shamrocks from our yard and over winters them in his office. And the following spring--I pull out all the dead bits--and they are ready for summer action again. They also come in a gorgeous leaf shade of dark purple. This little treasure is sitting happily in a 1900s french lavender waxed cardboard pot. 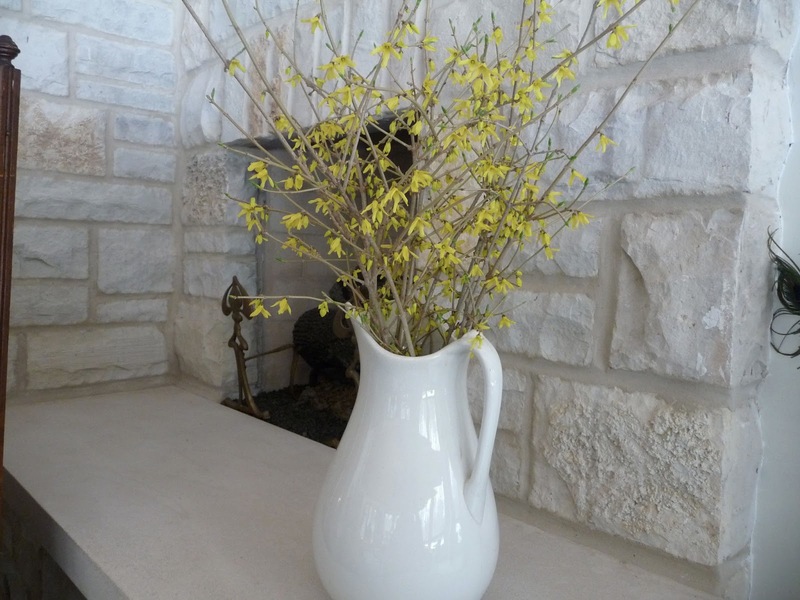 The pot says, Miel De Haute Provence aux Fleurs de Lavande. A. Terrasson, Apicuiteur. Riez. Now Mr. Terrasson raises his bees in Riez France. Riez also means "laugh." It certainly makes me smile. No more whining about winter. Just action. I dug out a white English ironstone pitcher. The kind that would have had a white washbowl with it and graced every American dresser in the 1800s. I rooted around in a junk drawer in the kitchen that contains untold treasure I am sure. But all I was looking for was my garden pruners. I once again put on down coat hat scarf and gloves and slogged into the back yard to the forsythia bush. I think I felt ice pellets on my face while I cut a dozen-ish stalks with the very itsy bitsy nobs that might have been buds--but who could tell because THERE WERE ICE PELLETS HITTING MY EYEBALLS. 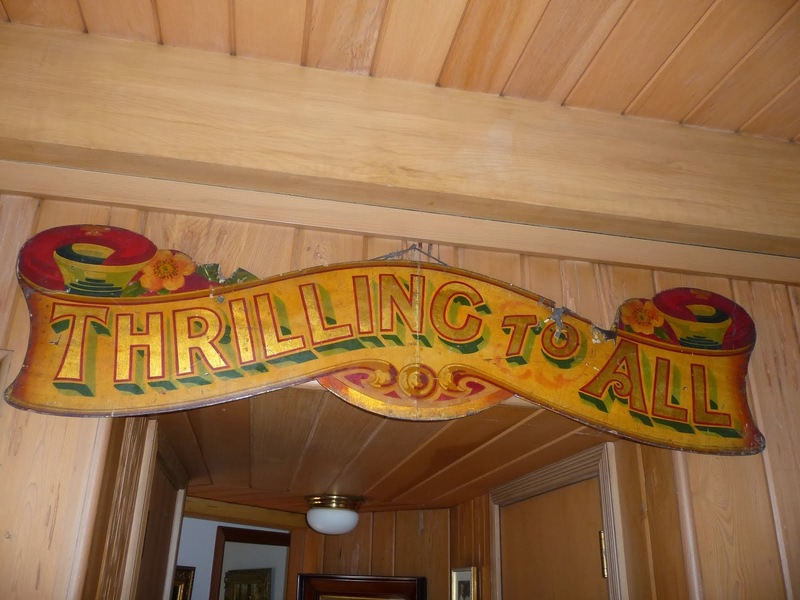 I promised a little book talk in this blog--and this book talk is a wonderful compliment to the world of vintage. 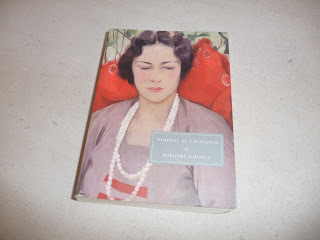 I have recently discovered Persephone Book of London--and I have found a new book love. I take this description from the back of their catalogue, " Persephone Books reprints neglected novels, diaries, poetry and cookery books, mostly by women and mostly dating from the early to mid-twentieth century." Ho-hum-who cares? Oh but WHAT they publish and HOW they publish. Further--they describe that they appeal to the "discerning reader who prefers books that are neither too literary nor too commercial and are guaranteed to be readable, thought provoking and impossible to forget." They have published 100, including several "classics." The classics as determined by them--don't think Shakespeare--are paperbacks with startling colorful and eye catching covers. The other books, are richly published with gray covers and highlighted by fabulous colorful representations of tapestries-fabrics-artwork--and include a complimentary book mark. 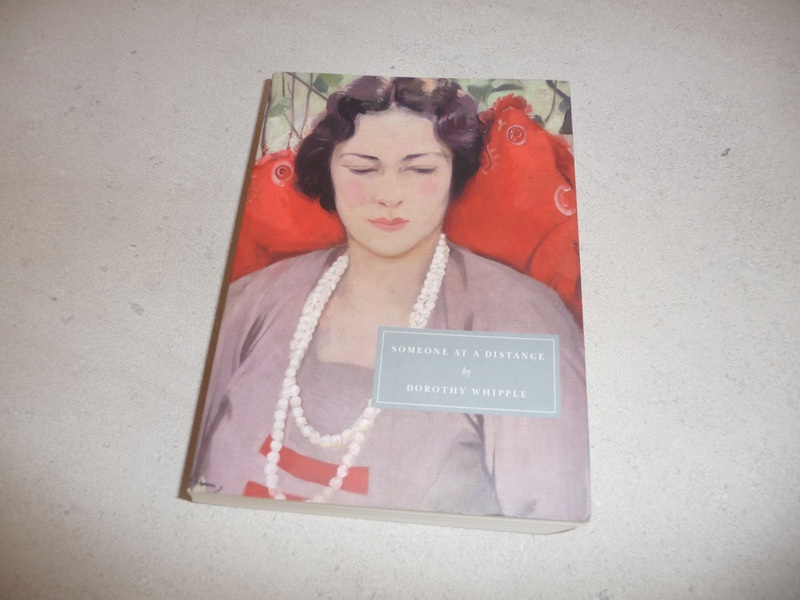 I am reading Someone At A Distance by Dorothy Whipple. I can't put it down. No--it does not have riveting action, Fifty shades of passion or foreign espionage.There are no kidnapped children or vampyres or political diatribes. Her writing is brilliant. And very English. Although not all authors that Persephone reprints are from the UK. 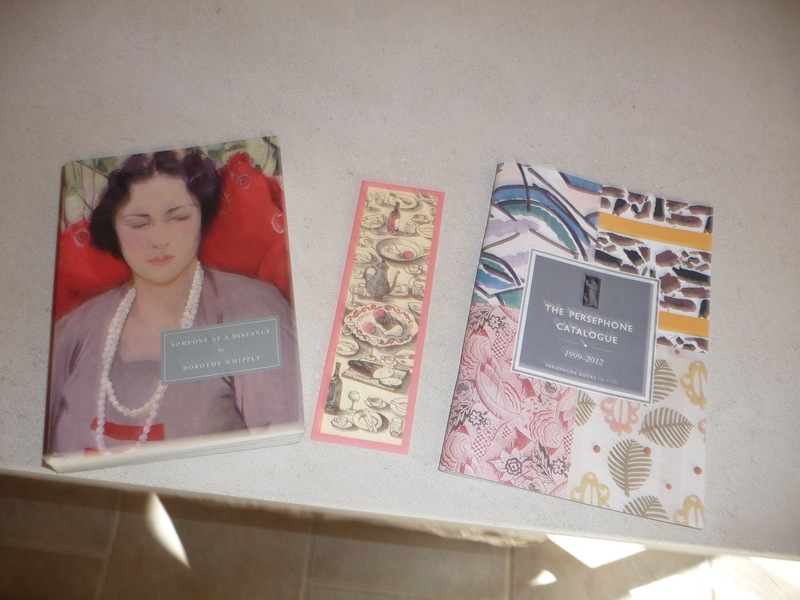 I went on the website www.persephonebooks.co.uk and requested a catalogue. They sent it within a week--along with a bookmark and a copy of their last issue of The Persephone Biannually which is full of wonderful articles related to their offerings. I am paging through, making notes--and a VERY long list of the books I want to purchase. Best of all--they have a bricks and mortar shop in London. Dear Husbola and I will be in London later this spring. When The Dear One and I have our separate "afternoon on our own" in London--you can be assured where I will be heading. They even have folks who will come to your book club to talk (in London of course) and readings of their offerings including wine and canapes at some. Oh my. No mentions of nooks or kindles. No directions to download text on computers. Now don't get your bristles up if you own one of those devices and love it. I speak from ignorance. Don't have one and don't want one. I just want another persephone book with the fabulous rich paper and color and the time to flip through the pages and take a long whiff at the great smell you can only get from a not yet read book. Enough already. Here in Northern Illinois winter decided to delay Her Glory until February and now March. Yeah yeah yeah--ok--pretty look from our kitchen out to the pond. I will put on my happy Gardener Face and be glad for the moisture--but in this same view--by this time for many years, gazillions of little snowdrops bulbs were blooming. I spent a few minutes today focusing on vintage yellow things in our house. As many of you know, Dear Husbola has planted in excess of 15,000 daffodils over the years--and our yard is a riot of incredible color later in the spring. 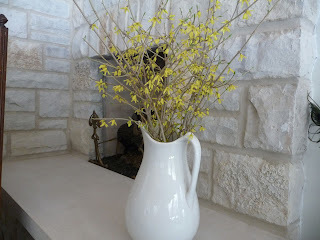 I always know we are over winter and firmly into spring and open windows when I see the color yellow. 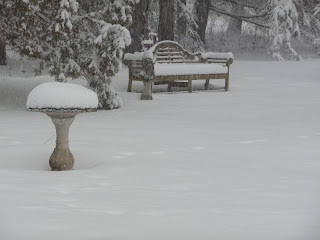 So--I am trying to fool myself into spring thoughts. This photo came out a bit dark--but this is a favourite yellow painting--the Old Schoolhouse in Cowbridge UK. 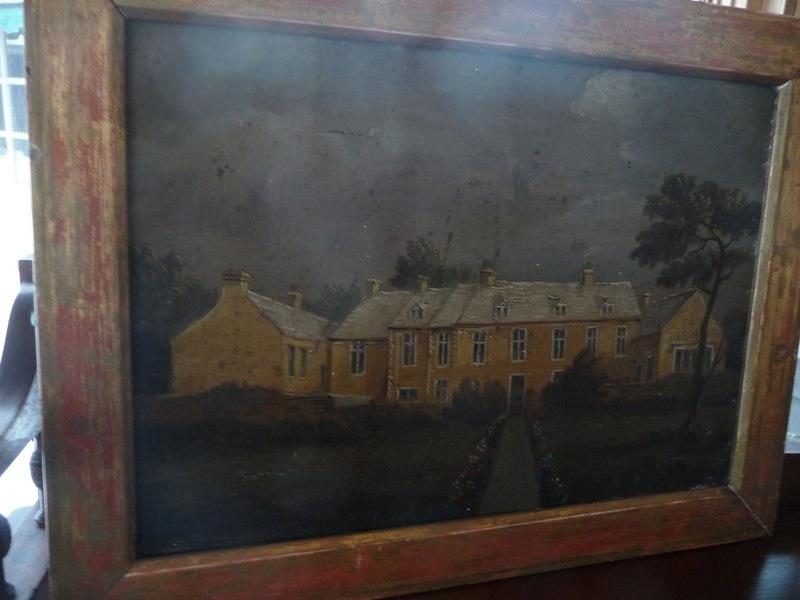 I bought this framed painting--on tin--years ago at Shepton Mallet in Castle Cary England. The dealer was a great gal--who had the most incredible eye for fabulous things. Her stall was always small--but packed with all sorts of one of a kind things. On the verso--it identifies the school in old ink and lettering. The Dealer said she had gotten it at a house clearance--and it was turned upside down and being used to cover a hole in a floor board. The yellow siding makes me smile. 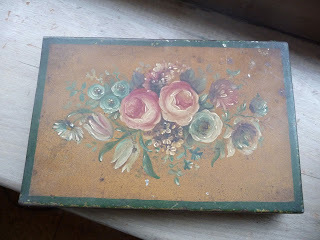 Who painted this lovely piece--easily circa 1850?? My obsession with toleware takes on a yellow look as well. This 1920s French piece is a book box. Slender, with a tight fitting lid. 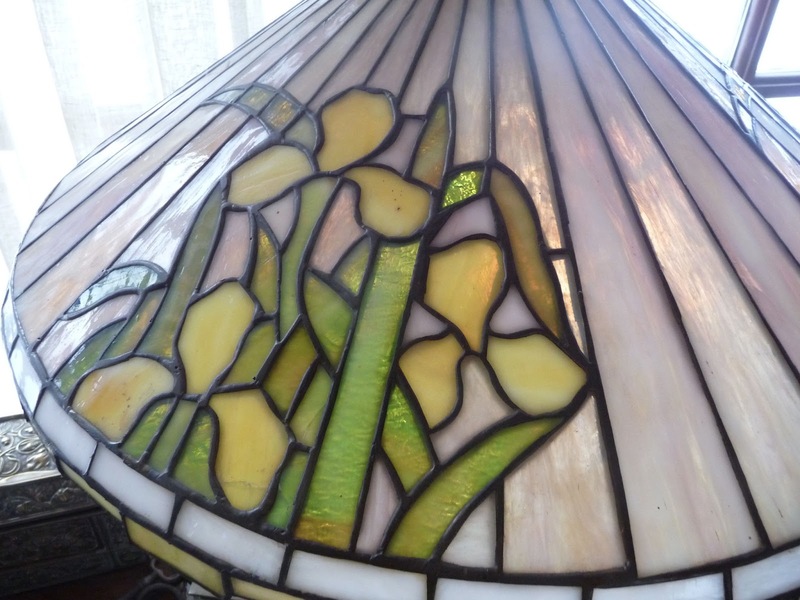 Daffodil theme continuing--I changed the location of a leaded glass lamp so that the flowers could cheer up our living room. My last piece of yellow--well maybe not yellow--but more cream colored. Chicken breasts stuffed with cornbread and wild rice stuffing for dinner.